Newton South's Clare Martin en route to a 4:51 mile at Saturday's meet. In what has become a common theme the past month, Clare Martin clocked yet another nationally-ranked time on the track oval. The Newton South senior's latest effort came in the mile at Saturday's MIAA Eastern Division 1 Championship. Martin took all the guesswork out of the outcome early, and won convincingly with a state-leading time of 4 minutes, 51.75 seconds. She was well ahead of teammate, Caroline Barry, who was second with a solid 5:08.64 clocking. Martin also earned gold in the 800m with a time of 2:14.88. In the team competition, Andover defeated second-place Newton South, 84.5-79, for the girls' title. Lowell claimed the boys' crown, 79.5-67 over runner-up Boston College High. 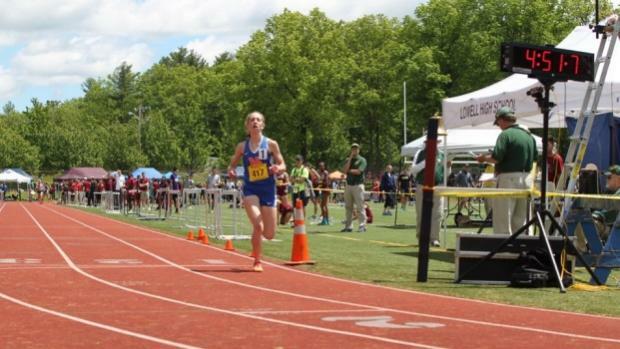 MileSplit MA will have more on this meet coming soon.